Those of us able to get our exhausted, post-finals-partying asses out to the city this weekend will get to revel at pirates and human crayons, smurfs, grapes, walking bacon strips and on and on. 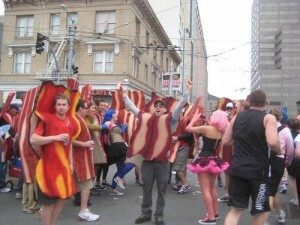 There’ll be people dressed as bears chasing people dressed as salmon “upstream” (backwards on the race course), and of course San Francisco’s premiere collection of wrinkling nudists will make their customary appearance (okay, okay, so that one’s not really worth getting out of bed for), while residents along the race course blast music and cheer for all of us costumed runners and walkers at their doorsteps. The party — ahem, race — starts at 7 AM. Don’t miss it. 1) People dressed as lumberjacks (flannel, lots of flannel) carrying paper-mache axes can chase people dressed as trees (just carry around some actual branches). 3) A variety of late-night foods: omelettes, pancakes, fries, hot dogs, burgers, all made from cardboard or cloth salvaged from thrift stores and co-op free piles. 4) Hippies. Because we can (or already are). 5) Overachieving vegetarian idealists who will work for a non-profit after stints in the Peace Corps and in WWOOF (oh wait, what do we wear for this one?). 6) We’re tired and out of ideas. You send us one.